Looking for a sweet treat worth spending calories on? Check out the lineup! Directions: Mix 2 tbsp mix with 1 tbsp water in a microwave safe mug. Stir until well mixed and microwave for 30 seconds. Add some cool-whip on top for an extra treat! Make sure to get the low-fat brownie mix. Directions: Mix 3 tbsp mix with 1 tbsp vanilla greek yogurt (I recommend Oikos) in a microwave safe mug. Stir until the mixture is silky smooth (it takes a few minutes to mix in the yogurt). Microwave for 45 seconds. Add some cool-whip on top for an extra treat! I found this recipe on the Duncan Hines website. Directions: Mix together the 2 cakes mixes in a gallon ziploc. Mix 3 tbsp mix with 2 tbsp water in a microwave safe mug. Microwave for 1 minute. Let stand for 15 minutes before eating. (Technically not a brownie, but close enough). Try any flavor cake mix - spice, carrot, red velvet. Add fruit or a whipped cream topping! 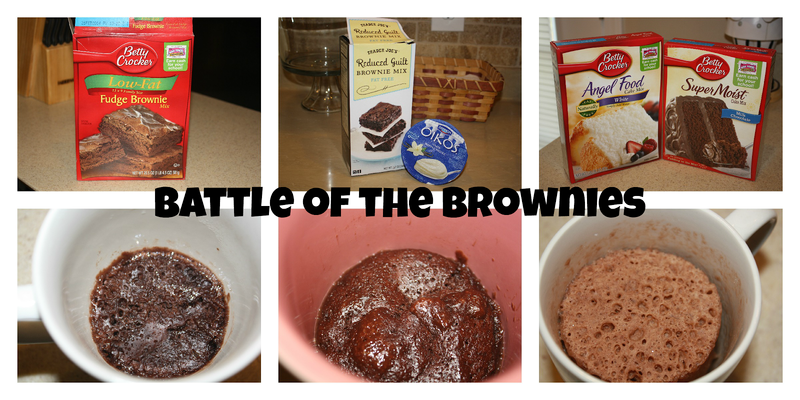 The best part of a microwave mug brownie? There isn't a whole pan laying around to tempt you. Try them for yourself. I'd love to hear which you love best and how you made them your own!